Hall of Famer Henry Chadwick has long been known as "The Father of Baseball." In our last ”Chin Music” column we published a letter written by MLB’s Commissioner, Bud Selig, which stated his belief that General Abner Doubleday is the “Father of Baseball.” The column set off quite an Internet firestorm, thanks to Deadspin picking up the story, and surprisingly, the game’s alleged roots in Cooperstown are once more in the news. Some readers have questioned whether the story itself is one great big hoax; Keith Olbermann, on his MLB.com blog, has posted further inaccuracies about the ”Doubleday Ball” and questioned the authenticity of Bud Selig’s letter; and another writer even posted a satirical, “Yes Ronald, There is an Abner Doubleday” letter. What’s more, Bud and Abner are the unlikeliest of allies, being that the General’s descendant, Nelson Doubleday, former owner of the New York Mets, once accused Selig of cooking MLB’s books and being in “cahoots with Fred Wilpon,” his former Met partner. When Baseball Hall of Fame founder Stephen C. Clark and National League President Ford Frick first established the game’s shrine in the late 1930s it was part of a celebration to commemorate the 100th anniversary of Doubleday’s alleged ”Invention” of the National Pastime on a cow pasture in the tiny village of Cooperstown. The first item on display was a tattered ball purchased by Clark in the 1930s from someone who alleged the ball once belonged to the “Doubleday Myth’s” creator, Abner Graves. Clark, an heir to the Singer Sewing Machine fortune and the world’s most prolific collector of Van Goghs, Renoirs and Picassos decided, without any proof, to portray the ball as the one Doubleday used in Cooperstown in 1839. 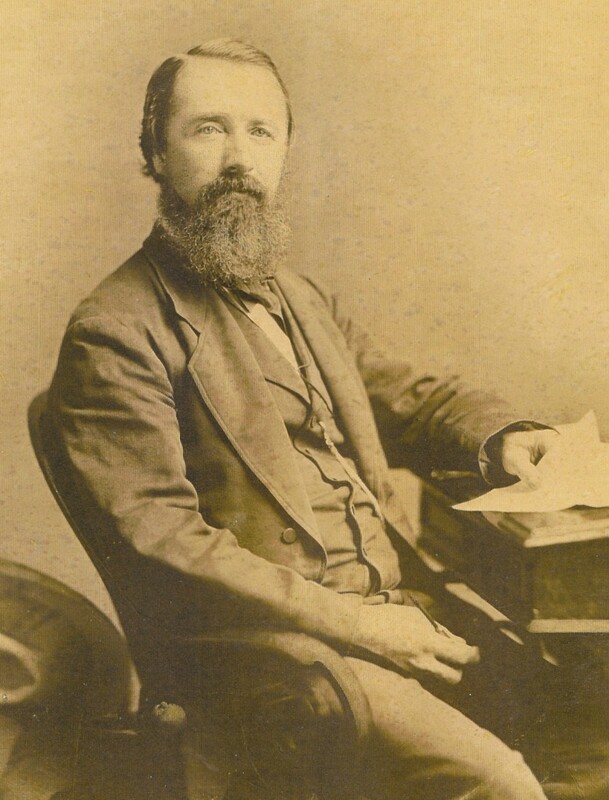 Henry Chadwick was honored for his contributions as the game’s first prolific sportswriter and as an innovator in record-keeping and statistics. Alexander J. Cartwright was honored for his contributions as a member of the pioneer New York Knickerbocker Base Ball Club in the 1840’s. When Cartwright’s family protested the Doubleday story, alleging that Cartwright was the founder of the game, Clark & Co. got spooked and, in response, honored Cartwright with a plaque and his own “Cartwright Day” celebration. Dodging that bullet, Doubleday’s standing as the game’s “Father” stood. As the Baseball Hall of Fame collected donations of items related to its honorees in its fledgling days, artifacts with ties to both Chadwick and Cartwright made their way to Cooperstown. Cincinnati Reds owner Powel Crosley Jr. donated letters written by Chadwick to Reds owner August Herrmann at the turn of the century and Cartwright’s grandson, Bruce, donated actual Knickerbocker Base Ball Club dinner receipts from the 1840s. An on-going Haulsofshame.com investigation into the considerable thefts from the National Baseball Library has yielded numerous confirmations of rare documents and photographs stolen from Cooperstown. The investigation has also revealed that at least one letter from Chadwick is missing and both Knickerbocker receipts donated by Cartwright’s family are missing, as well. 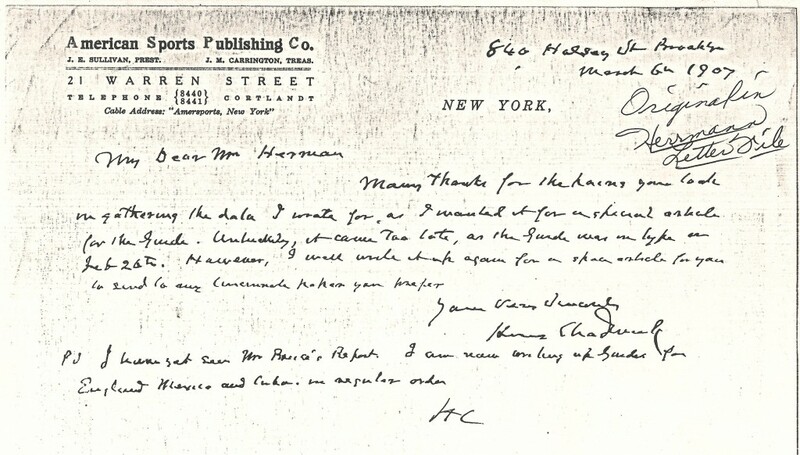 The entire Herrmann collection was recently catalogued and conserved thanks to a grant from the Yawkey Foundation, however, scores of letters originating from the collection have been documented as being sold in public auctions like Sotheby’s, Robert Edward Auctions, MastroNet Auctions, Heritage Auctions, Richard Wolfers Auctions, Mike Gutierrez Auctions, Superior Auctions, Christies, Lelands and others. Hall of Fame officials were notified of the photocopy of the missing Chadwick letter several months ago and have been unable to locate the original document. This rare receipt for a team dinner of the Knickerbocker Base Ball Club in 1847 is presently missing from the National Baseball Library. It was donated by the grandson of Hall of Famer Alexander J Cartwright Jr. But Hall of Fame records reveal that Bruce Cartwright Jr. sent the documents to Cooperstown in May of 1936. 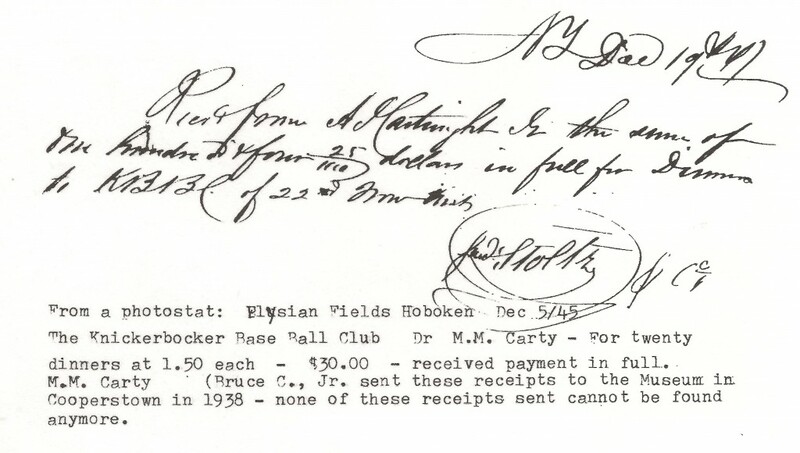 On December 4, 1935 Cartwright wrote the Museum and said, “I write to you regarding items I would like to donate to the National Baseball Museum in memory of my grandfather…the “Father of Organized Base Ball.” Museum Secretary Alexander Cleland wrote Cartwright on May 29, 1936 and stated, “I want to thank you most heartily for the material you sent me for the Baseball Museum…The “Dinner Receipts” and the paper of 1902 are to be put in one case.” The same Knickerbocker receipts were next documented on display at the Museum in August of 1938 as reported by Cooperstown’s Freeman’s Journal. Chadwick and Cartwright are popular marks for thieves of historical baseball items. A significant letter from 1865 penned by Cartwright to one of his old Knick teammates, Charles DeBost, has been stolen from the State Archives of Hawaii, and personal items that were part of Chadwick’s estate have been pilfered from the New York Public Library’s famous A.G. Spalding Baseball Collection. (The Cartwright letter stolen from Hawaii’s Archive has been sold three times in excess of $20,000 by Lelands, Sotheby’s and Robert Edward Auctions). Also stolen from the NYPL were the original score sheets from a Knickerbocker match played on June 19, 1846. As we reported in our last column documents signed by Abner Doubleday have also disappeared from the New York State Archives. While some may argue baseball’s paternal lineage, one thing is clear. The “Father’s of Baseball,” both real and mythical, are “hot” commodities in the baseball marketplace. Has Hawaii recovered their Alexander Cartwright letter yet? These cases of loss or theft get more and more disturbing. We were notified by the Archives of Hawaii that they had reported the theft to Hawaii’s Attorney General. We will be following up on that situation in the near future. This is so disheartening! I am still upset about my grandfather’s, autopsy records and admission records being stolen from Memorial Hospital, plus his wills from the Probate Court. When will this “morbid” collecting stop? When will this stealing stop from our institutions? It ruins it for the researchers like myself, who would like to see these letters and documents. It may, one day, when we will not be allowed to see them, except from behind glass with pieces the institution decides to show. Irresponsible institutions like the NYPL and the Hall of Fame must be held accountable too. What would have happened if the University of Chicago was the one finally chosen to receive the Spalding collection? Would they have taken better care of it? it has been proven that Cartwright is less reputable than Doubleday and the ball that they have found evidence that the Doubleday ball belonged to Doubleday and then it was given to his good friend and Mr.Abner Graves. the hof had a rough go to start but now everything is behind glass. they are not responsible. They have fixed the theft problem if you want to go to a hall of fame without any glass behind any of the artifacts go to the pro football hall of fame. you can get a game worn Joe Namath jersey and leave the place and get right back on the highway to Cleveland. if you want to hold someone accountable hold the football hof accountable not the respected NBHOF.